AFRICANGLOBE – “Everything in the world revolves around Africa. From the Starbucks coffees to Apple iPads, Microsoft’s computers, Airbus’ aeroplanes and the components of the Mars Curiosity Rover; even the resources employed by NASA to man its missions – all these things are taken from Africa though Africa doesn’t get paid its true worth”. – Dario Thurston. Most importantly, there is no doubt that Africa still has in its possession, a vast amount of untapped natural resources. Apart from the gold, diamond, copper, uranium, cocoa, and many other strategic natural resources which are still in abundance, there are plenty of oil and gas reserves in Africa that hasn’t “officially” been discovered, though many of such discoveries were actually hidden until further colonial interests recently developed. Zimbabwe, a country which the corporate media sometimes refer to as a “failed state”, is also said to be proportionally the world’s richest country (resources divided by population) and we are already starting to see what it is capable of doing on its own terms. But it is no wonder that imperialist powers have also been fighting hard to remove President Mugabe at all cost and to put in his place someone who will sell off these resources to the West, just as they recently did in the Ivory Coast under their usual hypocritical guise of “democracy”. As for Libya and Nigeria, I don’t think there is any need to discuss their resources and the strategy currently being employed to loot these countries. The chaos in Libya today, the foreign-backed rebels currently operating in Nigeria (Boko Haram) may explain the strategy often used to destabilize the prospects of a country and the subsequent looting of their resources just as it is on-going in the Central African region. In the case of Nigeria however, the problem is not that they have passionate leaders that are working in the interest of the ordinary citizen (did you notice how many Nigerians were murdered in Libya without the government doing anything?). The problem however has to do with the growing Chinese influence in the country and how the West seeks to contain China, hiding behind rebels as a justification to establish military bases across the Ecowas region (under the guise of fighting terror), after which more military pressure can be mounted on the African leaders to distance themselves from China. At worst, rebels will be used to destabilize the country until Nigeria end up divided, just like they have successfully done in Sudan, (all because of oil). It is a painful truth but there is definitely the need to raise the awareness. Currently, there are strong indications which suggest that South Africa could soon be targeted by rebels as well, unless the people discover the truth and act immediately. Any African country that has strong economic prospects must continually be on guard, as imperialism is on high alert to suppress economic growth in Africa. The situation is like a vampire which survives by the suppression of its host, usually tearing its prey into pieces. Otherwise, there is no reason for Africa to be bleeding today. In the next few years, if Africa’s resources could be managed efficiently, certainly there would be no poverty anywhere on an African soil. But how can Africans continue to dream of wonderful future economic prospects, when majority of the youth who ought to be the most strategic African resource are being abandoned for cocoa, copper, oil and gold? Is Africa truly investing in her youth to take over the management of these plenty resources from the hands of the foreign “advisers”? When will Africa discover that the youth are her most valuable untapped resource? A continent that continues to abandon its youth is indeed a continent with no future. Today, in their quest to receive quick revenue for their families and their political rallies, our leaders have been keen on selling off Africa’s natural resources to the point where little or no attention is paid to training the youth who ought to be the future managers of our economy. 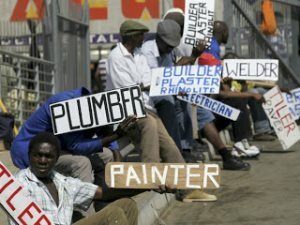 Our streets have been overcrowded with too many young men and women selling dog chains, foodstuffs, bread and sachet water, while many of them ought to be in the factories, doing productive works or in the technical/engineering schools studying practically-related courses that focus on solving real life problems. Every year, the rate of people who do not get the chance to enter the secondary schools and tertiary institutions continue to rise. Though many African leaders had the opportunity to attend some of the best schools at the tax payer’s expense, no effort is being made to ensure that the mass majority of today’s youth could enjoy the same privilege. Because of the lack of adequate educational infrastructure here at home, parents are forced to send their children abroad for studies, often paying ten times the cost: an amount that could boost our local academic institutions if we were to expanding the structures. Meanwhile the lack of industrialization means that majority of these students have little or no hope of gaining a job back home. As a result, many of those with degrees and relevant qualifications are still stranded in Europe and America, cleaning and washing dishes despite having master’s degrees. Is this the destiny of the African youth? Certainly not. Today, the whole population of China is an economic advantage. Thanks to ambitious industrialization. Though they’re currently about 1.5 billion in population, the people of China have managed to put themselves to work and are grabbing jobs at every corner of the earth. This is so because the government has invested huge resource to ensure that their educational system places emphasis on science and technical education, unlike our style of education that is characterized by theories and stories that often have no real-world solutions. Unfortunately in Africa, instead of helping the local industries to flourish, the banks are rather looting the people and crippling the local business community with high interest rate, usually over 25% APR. The last time I checked, the “official” interest rate figures across many African countries were over 15% whereas in Europe the figure is below 3% in many countries. Meanwhile, regular commercial banks in Ghana are charging annual interest rates of between 15% and 30%! Therefore many local industries are lacking adequate financing and many are being forced to shut down operations, forcing many to lay off their workers. All these conditions have been strategically designed to cripple local African industries who may rely on banks to expand their operations, at a time when our governments and the politicians continue to deposit their moneys in overseas banks that later turn around to loans these same money to our governments. “I have always believed that the basis of colonialism is economic, but the solution of the colonial problem lies in political action, in a fierce and constant struggle for emancipation as an indispensable first step towards securing economic independence and integrity”. –Kwame Nkrumah, (Consciencism, pg 98). It is very sad that the majority of the African youth are increasingly becoming more hopeless despite the fact that the continent continues to discover plenty of strategic resources, which only requires political foresight to bring about the needed benefits to the African people. As long as the youth who are Africa’s most strategic resource are being abandoned, it remains to be seen whether the continent can hope for a brighter future. The writer is a Pan-African analyst and a well-known social commentator in Africa. He’s the founder of the Project Pan-Africa, an organisation that seeks to create a mental revolution across Africa. He is highly grateful to Itech Plus, and all the media which supports his vision for the African people.